This time, the hours for which I was a guide were not enough to make a one-day tour. I couldn't stay as a guide for a long time due to my job schedule, however, they accepted my condition. So I did my best to make our tour worthier. We met them in front of Kiyomizu temple. This is the first time to meet someone there. Usually there are so many tourists in and around Kiyomizu temple, and I thought it was very difficult to find each other. My expectation was completely betrayed. The sightseeing spots in Kyoto in winter may not be so beautiful as they are in a high season, but there is certainly the way to enjoy this old city. They wanted to do what they can't do without a guide. 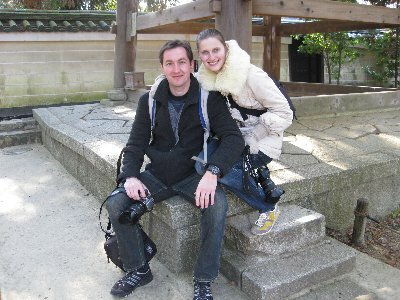 The first thing we did was Tea Ceremony.I took them to ENTOKUIN temple to have a tea ceremony. Not only in the typical tea room but in the traditional way, you can enjoy the ceremony in this temple. However, the people there cannot speak English, so Engilsh speaking guide is necessary to do this. Entering from a window-like door after walking on the stepping stones was also interesting for them. In the room, I explained where the guest territory is and how they should sit. In the room there is space for the guests and for the host. At first ,WAGASHI for tea ceremony was carried. The host sat and bowed very politely and said welcoming words. She put Wagashi outside of the guest territory and the guest pulled it to thier front. Before having tea, the guest have to eat all the served Wagashi. This temple is connected to Kodaiin, which was built for mourning Toyotomi Hideyoshi, the most powerful general in the 16th century. His symbol on the banner at the time of fight was so-called Sennari-hyotan, a gourd. The wagashi served here has a shape of a gourd. I explained the manner of tea ceremony one by one and they followed what I said. After that , they said that was really what they wanted to do. Then we went to Chionin temple. Chion in is a head temple of Jodo sect of Buddhism. There are about 20 Buddhism sects. 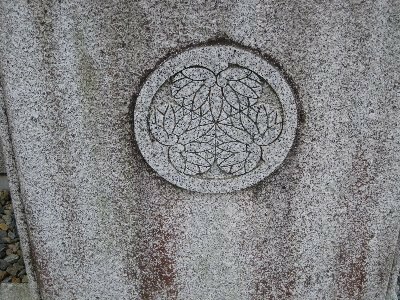 Jodo sects was the religeon of Tokugawa family, the last shogunate which lasted about 200 years. 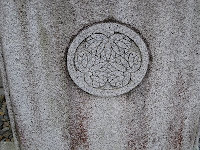 So we can find the family crest of Tokugawa family in this temple. This temple is a nice place for you to touch the surface of Buddhism. Most of the time, we can hear the monks chanting in the big hall. Before entering the hall, I explained to them that, in this sect, people will be salvated if they chant a buddhist sutra, like "Namiamudabutsu----namiamudabutsu---". 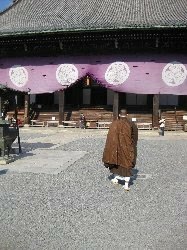 When we entered the hall, we heard the monks chants Namiamudabutsu----namiamudabutsu- in a low voice. We felt very solemn atmosphere. Then, we went to Shorenin temple. 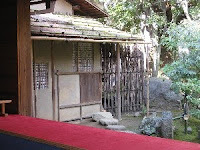 Till Edo period, a member of Imperial family used to become a monk of this temple. Once this temple was used as a tentative Imperial palace. In front of so-called Shishinden, the big hall, there are two trees which must be in front of the main hall of the real Imperial Palace, a cherry tree on the left and a mandarin orange tree on the right. You can walk through the garden, and at the last part, you can strike the bell. In buddhism, it is said we have 108 worldy desires. and they will be removed when we strike the bell 108 times. 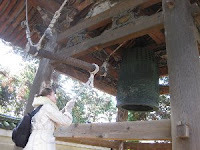 This is why the bell in every temple is struck 108 times at the end of the year to welcome the coming new year. After visiting those temples, we had OKONOMIYAKI lunch, and went to the last leg, Nishiki food market, not to mention I all explained Japanese food sold there.Blessed a fine weather, though it was a few hour tour, I had a good time and I hope they did, too.